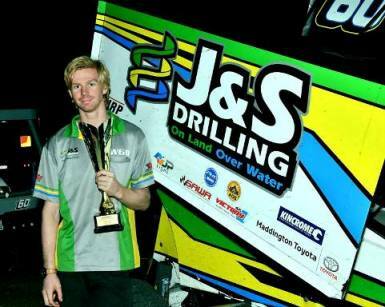 To say that the night that Kaiden Manders and the J&S Drilling W60 Sprintcar Team experienced at the Gold Cup finale meeting at the Perth Motorplex was very different to the norm would be the understatement of the year. Several times this summer the team has started off well and then been sidelined in the feature race by getting mixed up in accidents or the like. Last Saturday night, though, was almost in the "believe it or not" category. Manders was pushed away for the qualifying session, and in both of his heat races, only to have the motor not run properly and end up on the infield. The team worked feverishly in the pits to try and rectify the matter. At first it was thought to be a fuel issue, but it ended up being an electrical problem. After earning no points during the night, Manders was forced to start the 30-lap main event from the "back of the bus". He came out of position 16 and aided by a couple of red light stoppages had moved up to 11th after five laps. Following a caution light period on lap 10 Manders was running 7th. He went past several more cars over the next few circuits to be 4th on lap 16. With 10 laps remaining two of the cars ahead of him tangled and he was up to second. Manders dived under Mitchell Wormall for the lead but could not hold down that spot. The pair swapped places on several occasions before Manders consolidated his lead. He went onto claim the coveted Gold Cup event by nearly the length of the straight (2.65 seconds). "It was a really challenging night. The whole crew worked really hard to get the car fixed and get me out there for the feature. So it was great to reward them with a win. I had some great racing coming through the field and had so much fun. I can’t thank the whole J&S Drilling team enough for their efforts."